"We foresee a cyclical correction approaching and recommend investors to stay selective in Semis," Goldman Sachs said in a note Thursday. Nvidia is Goldman's top choice in the industry. Goldman downgraded Analog Devices and Maxim Integrated Products, saying there is "an increasingly negative outlook for" analog chipmakers "in particular." Goldman Sachs warned clients about a downturn coming for the semiconductor sector but still recommends some chip stocks. "We foresee a cyclical correction approaching and recommend investors to stay selective in Semis," Goldman Sachs analyst Toshiya Hari said in a note Thursday. Nvidia is Goldman's top choice in the industry, as the firm believes Nvidia continues to have a strong balance sheet. The firm reiterated a buy rating on Nvidia shares and added the stock to its conviction list of stock picks. Nvidia stock fell 0.5 percent in trading Thursday. Goldman downgraded Analog Devices and Maxim Integrated Products to sell from neutral, as well as Teradyne to neutral from buy, as the firm said there is "an increasingly negative outlook for" analog chipmakers "in particular." The firm said its No. 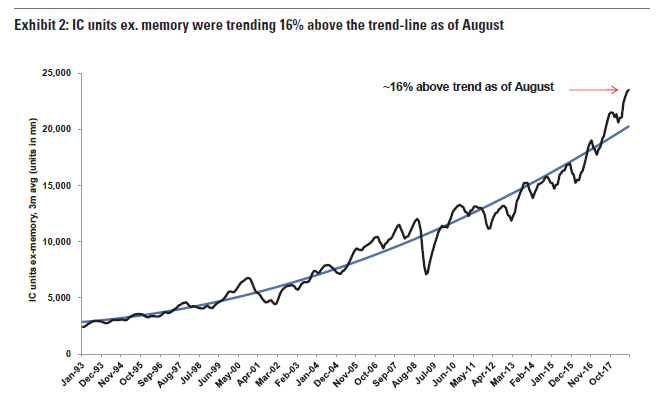 1 reason for a coming correction in the industry stems from the number of monthly semiconductor units "tracking meaningfully above what we consider to be the long-term trend-line." At 16 percent above trend, Goldman said "there has never been a time where monthly units were so far above the long-term trend-line." Additionally, Goldman Sachs sees a glut of inventory in the semiconductor supply chain and said "we have witnessed a flurry of negative data points in the Automotive ... and Industrial end-markets." The semiconductor industry gets 9 percent and 10 percent of revenues from autos and industrials, respectively. Those revenues are an even higher portion of analog semiconductor companies, according to Goldman, at 12 percent from autos and 30 percent from industrials. Goldman also upgraded shares of Keysight Technologies and NXP Semiconductors from buy from neutral, citing a robust outlook for the former and an underestimated valuation for the latter. The firm also bumped its rating of Texas Instruments to neutral from sell. Goldman said Texas Instruments has "relative defensive characteristics" protecting against the expected downturn for analog companies.